I am replacing the water pump in my truck. The original pump lasted 120k miles. I've since gone through two 30k miles replacements - they were both aftermarket pumps, and both done by a shop that I had thought did good work. However - "good work" would mean getting more than 30k miles out of a water pump, right? So I'm doing it myself this time. 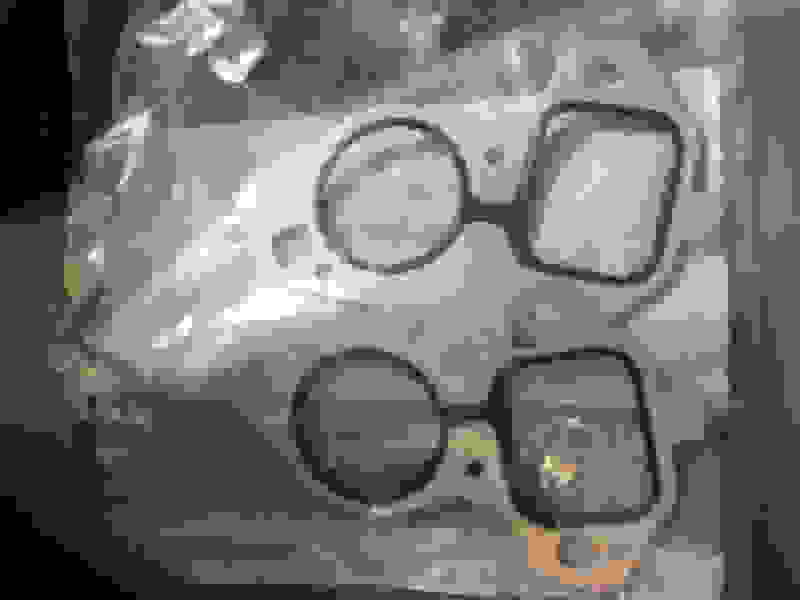 I am using ACDelco 251743 pump (with gaskets included) and 1511057 (thermostat). I found these same type of gaskets installed from last time - looks like black RTV was used. I suspect that it was in fact the gaskets/their install that failed (as opposed to the pump proper). Q: Are these metal backed gaskets supposed to be installed DRY? Or are they supposed to be installed with RTV? If RTV - what color? What surfaces are supposed to get RTV - the block? The pump? Both? Or, neither? Lots of video on the interwebs of guys installing things wrong, and I can't decide if this is one of them or not. I don't have a "CSM" for this vehicle - last time I looked Helm wanted $300 for it - maybe I need to buckle down and pay that. There's also a fake-out on the interwebs about the "old" vs. "new" thermostat styles that unnecessarily clouds the issue...this new pump and stat are both "new" so no problems there. I plan to hit the block surface with a surface prep wheel beforehand - there is definitely a ridge of crud around the mating surfaces. I'm still trying to divine the Truth here. That's what Oldsmobile guys are all about, right - The Truth ? Below are pictures of my 2003 5.3 "cleaned" but not yet ready for gasket install. I hit it with 400 grit but without much effect on either the pitting or the the "ridges" of foreign material on the blocks' mating surface to the water pump gasket. I think the foreign material is "black RTV", and I strongly suspect that is NOT supposed to be used in this application. I also strongly suspect that the last person to install a water pump on this engine (not I) did NOT thoroughly debris the mating surface - which was in turn marred by the first water pump replacement, which (probably) also used RTV. I hypothesize that using black RTV gets a new pump on without immediate leaks and then the customer out the door - but that the black RTV fails after less than 3 years. My colleague's father is a GM service writer. 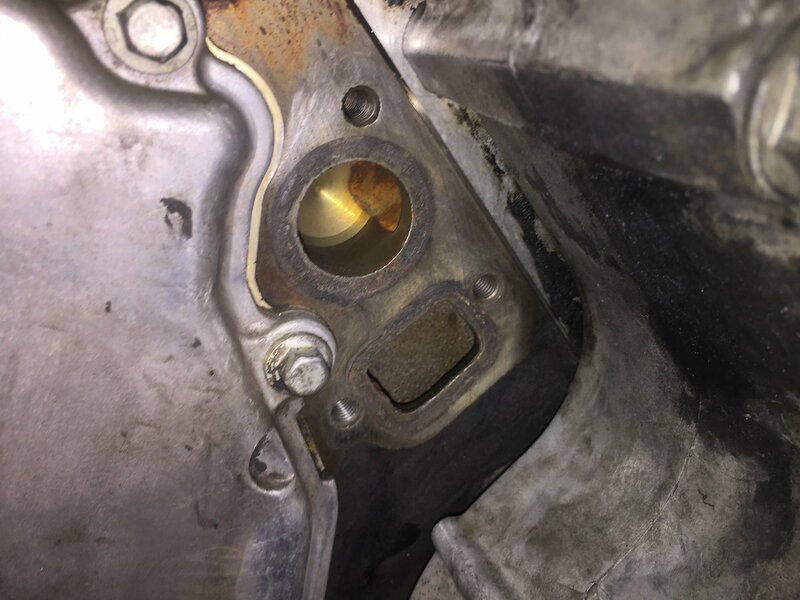 His advice (his GM mechanic colleague's advice) was "on the block where the water pump mounts: if surface is pitted, use white pipe dope, or orange RTV; if smooth, no sealant". So...there's no "orange" at the O'Reilly (it's Red) and I had thought that was really only best for _oil_ applications. I've seen White Pipe Dope at the plumbing store - that's what I call "PTFE"...is _that_ what the service writer is referring to? I'm out to them to see if the water pump gasket sealant product used at the dealership is available at the parts counter. PS - no points for mentioning the filthy nature of the underside of the alternator mount etc - this is AFTER a whole can of Gunk and several passes with a brush and a bucket of hot soapy water. Install dry, get the surface as smooth as possible, not sure the 400 grit is a good idea. Torque to specs. An aluminum pump on iron block with the o ring needs to be torqued correctly. With the 400 grit on the block, I would be tempted to use fiber gaskets with rtv. 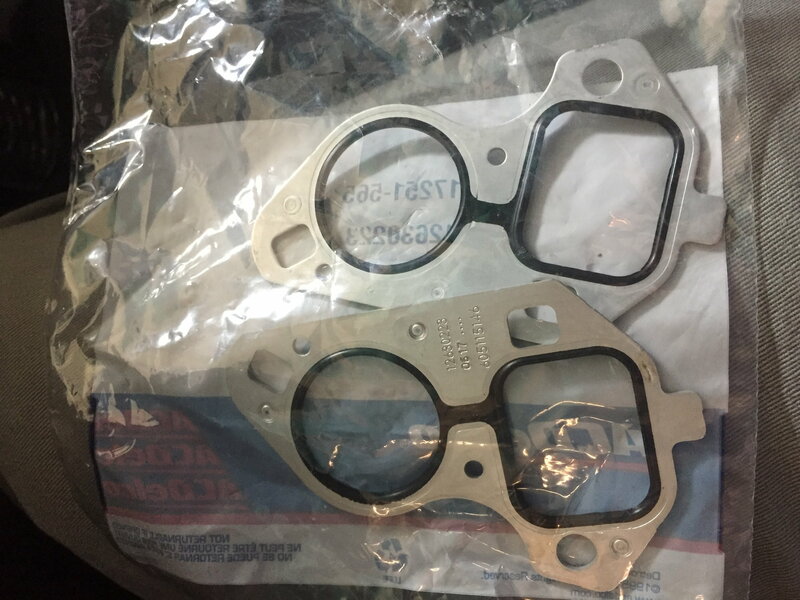 Yes, you can get fiber LS water pump gasket. Probably seal better with the 400 grit surface with rtv, less sensitive to torqueing with the fiber gasket. You seem to be suggesting that I marred the surface of the block with the 400 grit. But there's still foreign material to be removed...? I can feel it with my finger. How else would I remove the foreign material? Would you then counsel AGAINST using a flapper wheel on an air drill on the block face? you say the waterpump failed.or did it develop a leak on these gaskets? ?thats what my old suburban did.pulled the pump and replaced the gaskets"dry" and that cured the leak.i myself think those alum/rubber gaskets are junk.they need thicker rubber. I now realize that I did not empirically discern "where the leak was coming from" during water pump replacement at 140k. There is no sign of leaking at the weep hole of the pump I just removed at 170k. I couldnt tell where the coolant was most recently leaking from - it was initially only leaking on the cooldown cycle. Perhaps the OEM gasket is not Best for a used and abused mating surface? 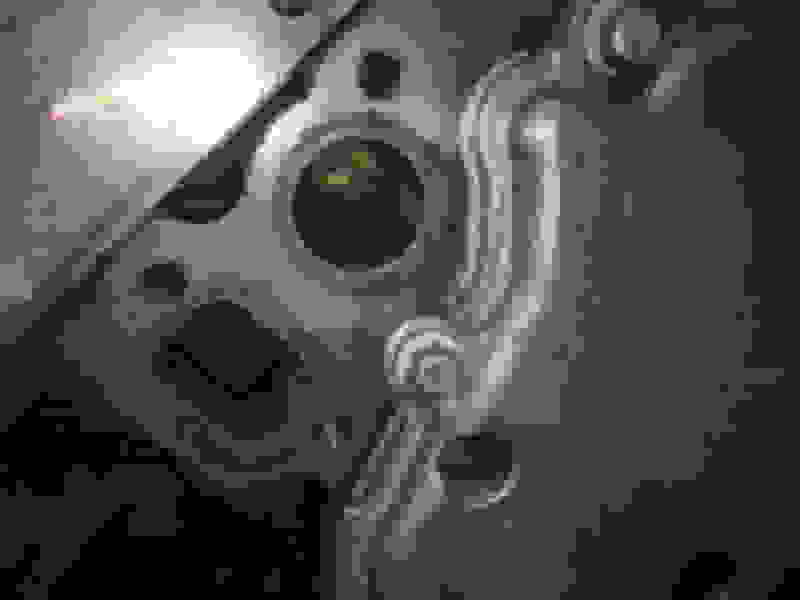 You might want to post over at LS1tech in the Gen III external engine forum. I recall someone else with the problem, turned out to be the steam vent. My post must be approved by a Moderator re: my brand new membership. Just an fyi. O rings seal best on very flat, smooth surfaces. The fiber gaskets and RTV can do a better job on a rougher surface. Water Pump gasket mounting, dry or ?? ?